When visiting any food establishment, you expect good customer service along with your food or drink. More ‘up-market’ establishments are where you’d find a high standard, with politeness and service with a smile. 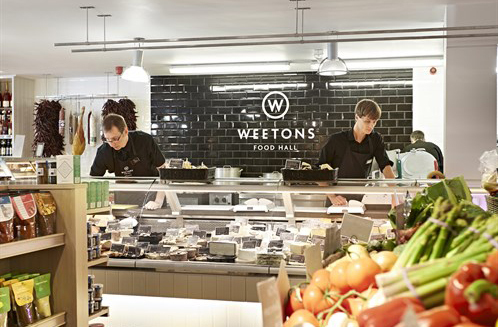 The last thing you’d expect is a personal attack in the form name-calling on your receipt – but this happened to a mum-of-one when visiting fancy Café Weetons Food Hall, located in Harrogate, North Yorkshire. 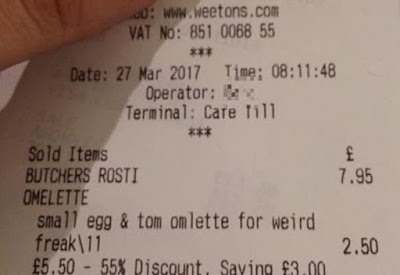 The mum, who wishes to be kept anonymous, ordered a smaller portion omelette for her 11-month-old child – a ‘child-size’, as being so young, they wouldn’t finish a full portion. The cashier behind the till taking her order found this request a peculiar, and argued that she should just order the regular size. 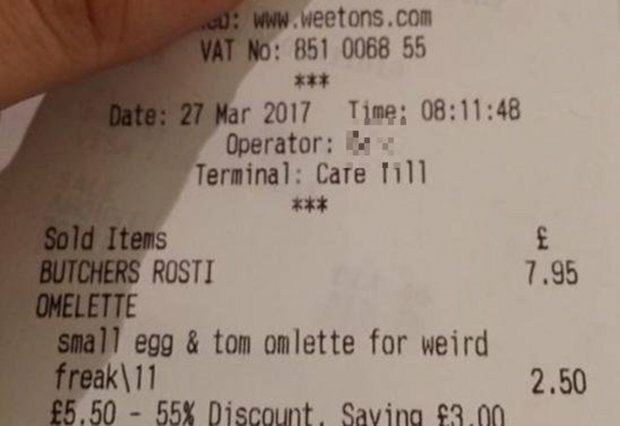 Clearly unaware of their rude comments being printed on the receipt, the Weetons employees handed over a copy to Mrs Dempster when she requested, after noticing the amusement and laughs coming from them. A refund but little explanation was given to the customer after complaining about the remark on the receipt. General Manager of the upmarket café, Keren Shaw, has spoken out about the incident: “Unfortunately today one of our staff acted in an incredibly unprofessional way and we are extremely sorry. “It is not the high level of service that we know our customers expect from us and which we expect from our staff.